After serving 19 years in the United States Army, retired Colonel Jackie J. Bryant is now strategic communications officer for the 7th Signal Command of the United States Army. Since 1990, Bryant has played a significant role in all facets of the Army’s communications. A native of Harlan, Ky., and son of a retired Army solider, Bryant desired to protect the freedoms of Americans from an early age. While serving as a captain, the Army offered him the opportunity to obtain a master’s degree in computer science. 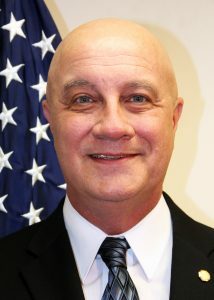 He selected the University of Kentucky for his computer science education and focused on Information Systems Technology Management, a decision he says was instrumental to his success in architecting and providing IT systems for Army organizations. During his years of service in the Army, Bryant held twelve different positions, each increasing his scope of responsibility. As chief of staff for the Signal Center from 2004- 2009, Bryant’s cumulative expertise in human resource management, information technology management, funding management and organizational structure enabled him to manage an annual budget of $125 million, including $85 million in contracts. He oversaw the training of over 17,000 students in IT skills and ensured the most efficient organizational structure for instructors, equipment and course length through the Signal Center of Excellence. Prior to that role, he served as chief of the Joint War fighter Division from 2002-2004, where he directed four branches responsible for providing C4 support to U.S. Army Forces Command units consisting of 85 percent of the total Army Force. In addition to identifying signal resources for Operation Enduring and Iraqi Freedom, Bryant operated a 24×7 operations center designed to proactively solve C4 issues and keep the command informed. The center also provided C4 support for all Homeland Defense operations and manning for major U.S. Northern Command exercises. He earned 14 different honors and accolades during his distinguished military career. him to provide strategic communication, knowledge management and public affairs programs in the service of the entire Army within the U.S. as well as Puerto Rico. He also formulates strategic communications messages to facilitate the understanding of the command’s issues, challenges and opportunities across the Army, joint services, industry, the media, supported agencies and commands as well as the general public. He has direct command of wide public affairs efforts, including public information and command information functions. for all active, reserve and National Guard, officers, warrant officers, enlisted members and civilians, as well as any former members of the Signal Corps to aid in preserving for posterity the proud heritage of the U.S. Army Signal Corps Regiment and Signal units throughout the world. Bryant lives in Evans, Ga., with his wife, Joanie. They have one daughter.